Mr Ashish Rohatgi is a leading consultant upper gastrointestinal laparoscopic and general surgeon based in London. His areas of expertise include oesophageal and gastric cancer surgery, gallstones, gastric reflux and hernias. He has been a consultant for 9 years, following his specialist training and fellowship in the South East Thames region where he worked in two major oesophagogastric cancer units. During his specialist training, Mr Rohatgi treated various oesophageal and gastric conditions, but he developed an interest in different types of resection of oesophagogastric cancer, for which he is renowned for in his field. Mr Rohatgi also runs a unique service at The London Clinic where he has set up a One-Stop Abdominal Pain Clinic. Here he quickly assesses patients suffering from abdominal pain, providing same-day follow-up appointments to discuss test results, their diagnosis for their abdominal pain and any recommended treatments. On top of his clinical commitments, Mr Rohatgi is also actively involved in research, with more than 25 publications and presentations to his name. • Singh KK, Rohatgi A, Rybinkina I, McCulloch P, Mudan S. Laparoscopic Gastrectomy for Gastric cancer- Early experience in the Elderly. Surg Endosc. 2008 Apr;22(4):1002-7. • Rohatgi A, Forshaw MJ, Sutcliffe RP, Strauss DC, Mason RC. 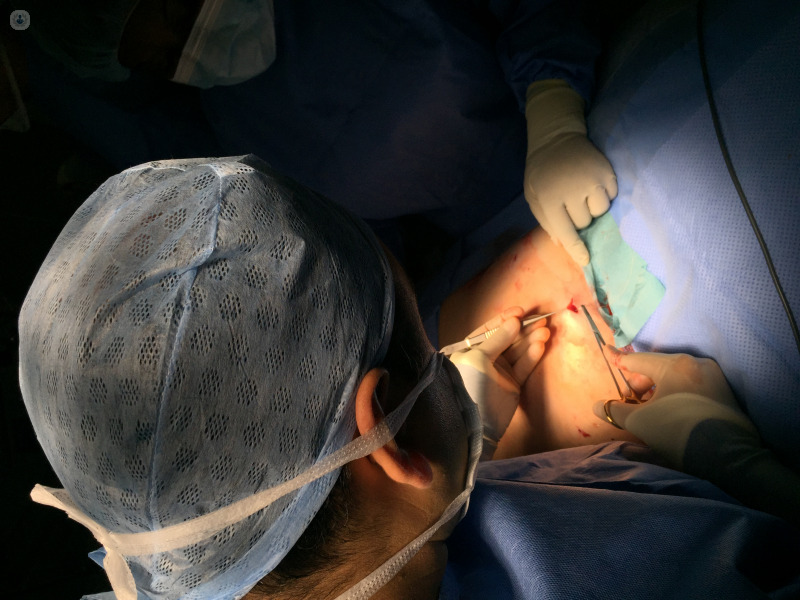 Training in Oesophageal Surgery– The Gold Standard ? Int J Surg. 2008 June; 6: 230-233. • Sutcliffe RP, Tandon R, Forshaw MJ, Rohatgi A, Strauss DC, Botha AJ, Mason RC. Anastomotic strictures and delayed gastric emptying after oesophagectomy. Dis Esophagus. 2008;21:712-7. • Rohatgi A, Forshaw MJ, Sutcliffe RP, Strauss DC, Mason RC. Technique and tips for Transhiatal oesophagectomy. Surgeon 2008 Dec;6: 335-40. • Sutcliffe RP, Forshaw MJ, Datta G, Rohatgi A, Strauss DC, Mason RC, Botha AJ. Surgical Management of Boerhaave’s Syndrome in a Tertiary Oesophagogastric Centre. Ann R Coll Surg Engl. 2009 Apr 30. • irnezami R, Rohatgi A, Sutcliffe RP, Hamouda A, Mason RC. Transhiatal Esophagectomy: Treatment of choice for High Grade Dysplasia. Eur J Cardiothorac Surg. 2009 Aug;36(2):364-7. • Mirnezami R, Rohatgi A, Sutcliffe RP, Hamouda A, Chandrakumaran K, Botha A, Mason RC. Multivariate Analysis of Clinicopathological Factors Influencing Survival Following Esophagectomy for Cancer. Int J Surg. 2009 Nov 6.